I've recently started one book and borrowed another, both of which raise great expectations in the fiction-to-be-taken seriously department. 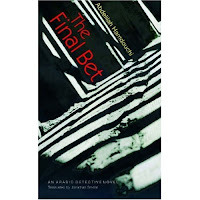 Abdelilah Hamdouchi's The Final Bet is the first Arabic-language detective novel to be translated into English, according to the jacket copy, and its author one of the first to write detective fiction in Arabic. Chingiz Aitmatov's The Place of the Skull not only bears a jacket blurb from Arthur Miller, but the Times Literary Supplement called it "arguably the most representative text of the Gorbachev thaw." Not novel or book, but most representative text, mind you. Now, while I see if these novels live up to their weighty promise, I'll ask you to ponder this difficult question of weightiness. Leonardo Sciascia comes to mind for his acceptance and impeccable credentials both as an important crime author and as an important author, period, no qualification. What crime writers enjoy similar acceptance both as masters of their genre and as important writers even to those who may not read crime fiction? How do you feel about claims for importance on behalf of crime stories? "The most representative text?!" Sigh. The embodiment of pretentiousness. I only see the old masters, such as Arthur Conan Doyle and Raymond Chandler, getting noticed by the academy. Naguib Mahfouz's crime novels dont count as detective fiction? The Thief and the Dogs for one features a master burglar, a detective on his trail, a revenge motive, a prostitute with whom he falls in love...etc. Dostoyevsky. Gabriel Garcia Marquez. Edgar Allan Poe. Sartre. Marco, I've never read Simenon's romans durs. How widely read are they? I have the impression, based on little evidence, that non-crime-readers like the romans durs and crime readers the Simenons. Dürrenmatt is a good choice, if only because he is said to have been influenced by Friedrich Glauser. Adrian, I read Midaq Alley and Children of Gebelawi back when a bunch of Mahfouz was being translated in the 1980s, but I don't know The Thief and the Dogs. I wonder why a much later novel would claim for itself the honor of being the first Arabic detective novel translated into English. Mahfouz's book must have transcended its genre, I guess. Loren, to be fair, it's probably not the poor author's fault that a critic/reviewer called his novel a text. PM, don't forget Borges, who turns up in crime fiction anthologies from time to time. Poe is an interesting case. I know he is firmly in the canon of American literature, but I don't know how critics and teachers regard his founding of various kinds of crime stories. Do they consider and discuss his importance as such a fruitful creator of "genre" fiction? The critics here seem to appreciate both the Maigrets and the romans durs .True Simenon fans (I know one) tend to read everything by him,while probably crime readers read only the Maigrets. Among the romans durs ,Trois chambres à Manhattan in particular is still very appreciated by the "general public". I have read a few of the Maigret novels and a collection of pre-Maigret stories but none of the romans durs. A panel discussion at the NoirCon conference in Philadelphia in the spring advanced the interesting proposition that some of the non-Maigret novels -- I think the one translated as The Watchmaker of Everton among them -- were noir stories but not crime stories. On my read Thief is a pretty standard crime/detective novel, allbeit an extremely well written one. There could be a political motive for ignorning Mahfouz - his defence of Rushdie, his rejection of the Muslim B/hood, his focus on unIslamic underworld activities such as prostitution, gambling and (gasp) drinking alcohol. And homosexuality, which also gets a mention in Midaq Alley. Wouldn't your guess account more for Mahfouz's reception in the Arab and Islamic worlds than outside it? I don't think he's that inflammatory that booksellers and magazines in the West would risk attack today by selling and promoting his work. My guess is that The Thief and the Dogs simply got lost among Mahfouz's oeuvre, or maybe that I just forgot it. I probably first heard of Mahfouz when I was reading about him in The New Republic years ago, and I don't remember reading about Thief then. Yes I know I'm a biased crime fiction booster but I think Thief is his best book. Cracking story, very accessible (Laura Bush read Thief on her way home from Egypt and loved it) and an interesting philosophical dimension contrasting the material world with sufi mysticism. Laura Bush may be cooler than I thought. I'm reading part of The Thief and the Dogs on Amazon now, and yep, there seems no reason it should not be mentioned with other "serious" crime novels. The opening pages, at least, seem to augur a story eminently accessible to readers of Westerns and crime stories, with the motif of the wronged loner returning from prison. There's at least one terrific, ominous line: "Who said I'm here for anything other than to reach an understanding?" As a German-lit type, I can say Friedrich Dürrenmatt is definitely canonical, though he's not usually praised (or put on syllabi) as a crime fiction writer. (I came to him via Der Besuch der alten Dame, which incidentally was the only German play most of my undergraduate students last semester had ever heard of. )I like the Barlach novellas and Das Versprechen, but I found them on my own. Susskind's Perfume also seems to get a lot of cross-genre praise, for reasons I've never quite understood. I'm not an enormous fan. I think Jakob Arjouni should be in this category, but he isn't - to the best of my knowledge he's not even a focus of those who research/teach German-Turkish writing. Partly because he sets his novels in Frankfurt, and partly because of genre limitations, I would guess. Oh, and Kästner's Emil and the Detectives may not be truly crime fiction, or great literature, or even written for adults, but a straw poll of my friends would suggest it's important! I should look for the Barlach books. A while ago, I looked for Dürrenmatt's crime writing and found The Pledge. I thought it full of gorgeous bleakness and human squalor but a bit heavyhanded. Your thoughts on Arjouni are interesting and probably speak well of your broad-mindedness in literary matters. I thought One Death to Die relied too much on hard-boiled cliches. More Beer! made smoother use of the noir conventions and also put a clever, chilling spin on them. But both books are firmly in that hard-boiled tradition, so it's a nice to see an argument for Arjouni's importance. Do many other German authors write as sympathetically as he does about gastarbeiter, Turkish Germans, and immigrants? I'd like to think I'm broad minded about literature, but in all honesty I haven't read all that much hard-boiled crime, so I'm less likely to recognise cliches. My thinking regarding Arjouni was less that he was a true cross-genre master and more that he should probably be part of a modern canon. (Putting my academic hat on and suggesting that the canon is specifically constructed and not always about quality - I like Arjouni's Kayankaya novels, particularly as a change from too many bucolic and overweight inspectors, but wouldn't argue for their overwhelming brilliance.) Certainly German-Turkish writing is an increasingly important aspect of modern German literature. The catch with Arjouni, which I had completely forgotten when I wrote my previous post, is that he's not himself Turkish - despite rumours. Thus his work isn't normally counted among that of writers with a gastarbeiter/migrant background, who are mostly the ones writing sympathetically about these issues. As a genre, this sort of writing seems to involve a lot of self-discovery and establishing a format/language/medium for discussing (in particular) Turkish German experience. (For example the films of Fatih Akim or the writing of Feridun Zaimoglu, whom I don't think is translated.) Thus Arjouni could be seen as a bit of an interloper, who is co-opting a literary language rather than creating one. Personally, I think Arjouni raises some major issues and makes them really accessible, which would suggest his work resonates beyond crime readers and has a certain importance. However, I must admit giving him that sort of status brings with it a fair bit of ideological baggage. I don't know. Would we rate Sciascia as highly if he'd used the same quality of analysis and prose in describing post-Vichy France as an outsider? In a recent talk I heard Giancarlo de Cataldo be pretty scathing about outsiders who write about Italy and the Iberian peninsula(his exception was Robert Wilson's novels)...can/should the same be true of people writing outside their own milieu but in the same language? I think I've wandered onto a different issue. Sorry! I was among those who once thought Arjouni was Turkish and was surprised when I found out he wasn’t. Since first reading him, I have come across at least one other German crime story about Turks in Germany, but it was inferior to Arjouni’s work. You say Arjouni “could be seen” as an interloper. Does he come across that way to German readers and critics? I’ve raised with several authors the issue of writing across –- and I hope you’ll forgive me a lapse into jargon -– boundaries, and my favorite answer came from Adrian Hyland. He said: "[T]here is no part of our world that should be 'immunized.' " In his case, that meant a white male Australian novelist creating a highly engaging female, half-Aboriginal protagonist. As far as I know, Hyland made no claims for his standing or his “right” as a novelist other than that to investigate an area of human experience he found compelling among a people he loved in a land he loved. I see no reason Jakob Arjouni or any other artist should be resented as an interloper as he long his claims don’t greatly exceed that. Interesting, too, that writing from a gastarbeiter/migrant background should involve self-discovery. I think authors and commentators in the Arab world are engaged in something similar when they create and write about crime stories. I don’t know if we’d rate Sciascia as highly if he’d chosen to write about post-Vichy France, but then who knows what sorts of books he’d have written had he’d made that choice? And here’s something I forgot to mention in a previous comment: Where does Gunter Gerlach fit in the canon of German fiction, whether crime fiction or otherwise? I’ve read one story of his, and I thought it was a brilliant piece of comic writing. I have read some Gerlach, but am in a bit of a hurry today - will get back to you on that. Re: Arjouni (and Hyland for that matter) and the idea of being an interloper, the only answer I can think of off the top of my head is about as jargon-laden as possible and relates to appropriation and post-colonialism...so I'll ponder it some more and try to come up with something comprehensible. Or better yet, I'll go and ask my colleague who specialises in this area! I will say, though, that since both Turkish-Germans and Aborigines are in positions where their voices are not always (allowed to be) heard, the stakes are higher than for, say, Donna Leon writing from the point of view of a Venetian policeman. I knew that post-colonialism and appropriation would eventually enter the discussion. I shall let my bourgeois values of fair play and respect for individual rights come to the fore, overcome my wariness of such theoretical terms, and await in good spirits the continuation of this discussion. I would agree, of course, that an author writing about and in the voice of Australian Aborigines or Turkish Germans is taking on a more delicate task than a Donna Leon or a Michael Dibdin. No one in Italy really sees Sciascia or Gadda as crime writers either,even if critics acknowledge that (some of) their works are influenced by/in dialogue with the crime fiction tradition. I suppose the key points are focus/intent and influence. That is,the fact that to them the form of crime fiction is a useful instrument,not an end in itself,and the fact that they did not have a meaningful influence on the successive generations of "genre" writers;both points that I believe apply to Dürrenmatt as well. Obviously you could say that the first point is also true for many crime writers,and maybe that's where the phrase "trascending the genre" often comes into play. Anyway,among contemporary crime fiction writers,one that I feel is recognized as an important author outside the genre is James Ellroy. I liked the Bärlach novellas.The one work I felt was very heavy handed in its moralizing was Die Physiker. If Sciascia did choose to write about post-Vichy France from Sicily,I doubt he could have maintained the same level of analysis. If I were to set a novel in Ireland,include some draw-by-numbers plot points (say The Troubles,Guinness,Drunken Irishmen,Famine and Emigration) writing not from the point of view of the foreign observer,whose occasional blunders and misconceptions can be excused,but inventing an improbable Irish protagonist,I doubt it would be well received there,regardless of its literary value. Similarly,many of the writers De Cataldo probably had in mind have only a passing aquaintance with Italy (and it shows) and yet they choose to write not as "tourists" but as insiders. Of course you can find counter-examples:just the other day Massimo Carlotto,who is extremely rigorous in the research and analysis of the milieu for his novels,praised Veit Heinichen,a German writer who lives in and writes about Trieste. But the risk of misunderstanding or oversimplifying aspects of a foreign experience should never be taken lightly. And if you chose to write "in the voice",it's not enough to stop at surface observation;you should have a good grasp of how the culture(s) s/he is grown in influenced the evolution of your protagonist in every aspect of his life. Marco, it’s interesting to learn that Italian critics may maintain the same division between genre and whatever one calls non-genre literature. The question of influence is worth thinking about, too, perhaps especially since Friedrich Glauser, acknowledged as a crime-fiction author, influenced Dürrenmatt. Focus and intent are good starting points for a discussion of what does and does not constitute crime fiction as long as it allows room for the fact the definitions of crime fiction have expanded over time and may well continue to do so. I wonder how Michael Dibdin’s novels were received by Italian readers and whether thay have been translated into Italian. One sly way he avoids easy accusations of colonialism or appropriation or the like is that his protagonist is himself a traveler from region to region. Dibdin thus avoids some of the pitfalls of writing in the voice of a native. It’s also a clever way of taking advantage of narrative opportunities offered by a national police force. Dibidin has definitely been translated into Italian, but I don't know about their reception. Except that Dibdin was probably the author de Cataldo had the least time for - I suspect on the grounds that his books are trying to be so 'insider'. Donna Leon doesn't want her novels translated into Italian (though they are available in Spanish), but I'm not sure how much of that is a privacy issue, and how much one of quality/authenticity. Marco, I'd heard of Heinichen but never read him - I'll have a look now that I know it's not hopelessly inauthentic. And I find your idea that certain genre divides might relate to how well later authors absorbed their themes very interesting. I wonder if that in part explains Camilleri's popularity outside the crime fic 'ghetto' - because he's seen to pick up classic ideas from Sciascia etc and thus seems out-of-the-ordinary. And on the topic of classic German literary mystery, there's always Leo Perutz's The Master of the Day of Judgement. His first three novels were translated in the Giallo Mondadori line (as paperbacks) 1-2 years after original publication. In recent years a small Florentine publishing house has began issuing more prestigious editions with new translations. Unlike Magdalen Nabb and some other (non-crime fiction) English writers living in Italy he has never reached a level of success that could have justified a debate on the authenticity of his portrayal of Italy.He had both admirers,who praised his style,and detractors. On the basis of the one book I've read,various comments and reviews I feel his Italy reads like a fanfiction of the real thing,with riffs on themes and places but never going very deep;he probably exemplifies the kind of author De Cataldo had in mind. I don't think his is necessarily a capital crime;there are Italian writers who set their stories in Romantic Ireland or Pop-culture Usa,and both Italy and Germany have had in the past two successful writers (Karl May and Emilio Salgari) who wrote series of novels set in countries they never put a foot on (Salgari is still widely read in some of these countries,like Venezuela). The problem arises when you read phrases like "If you want to understand Italy,you have to read Dibdin" which are simply wrong. Genres: I suppose I see genres a bit like the historical literary currents,with clouds of authors brought together either by shared aesthetic,literary circles (which today means prizes,conventions...) a common audience and/or technical innovations (the birth of magazine like weird tales,the pulps,astounding stories,did much to fix the form of their respective genres). And I think you're right with Camilleri,Lauren.The other reason,at least here in Italy,is the unusual language of the novels,which mix Italian and Sicilian very skillfully. Perutz:I've read 9 to 9 and The Marquis of Bolibar. I just remembered that I have some used,yellowed Glausers in my tbr pile.What should I read first? What's his best book? I have read that Donna Leon does not want her novels translated into Italian. Without knowing her reasons, I'd guess this shows a certain humility and respect on her part. With respect to Glauser, you might try any of the give. My favorites are probably "Thumbprint" and "The Chinaman." Lauren, the four Dibdin novels I've read have given me less the impression that he was trying to be an insider than that he was having a sly joke pretending to be an insider. "Cosi Fan Tutti" may be a key to understanding Dibdin's attitude toward the country where he lived for four (I believe) years. Marco: That might also be an anser to De Cataldo's accusations. Perutz is an excellent writer. I have something to say about one book of his on my blog. No need to apologize for joining the discussion late. The ability to do so is one of the great advantages of blogs over what are anachronistically known as the mainstream media. I've wondered about Waltari's reputation. He wrote sprawling novels set in remote periods, I think, so I always had this idea he was something like a Finnish James Michener. I think I have a copy of The Egyptian lying around my house, which I may pick up one day. And these comments may spur me to read Perutz. Some of his crime novels featuring lieutenant Frans J. Palmu could certainly be translated in English, since they are locked room mysteries and well written. I'll try to say something about them in my blog. And, yes, a comparison with Michener might be apt. Michener, apart from Sayonara, was never widely read in Finland, though. Waltari also tackles themes of mysticism which I don't think have much relevance to Michener. Juri, I'll try to remember to keep an eye open, but in case I keep that eye shut, let me know if you post something about Waltari, especially about his crime fiction. Thanks. Who says Ian Sansom writes cozies? Noir at the Bar III plus a chance to win books! Hey, publishers, what's behind the covers?